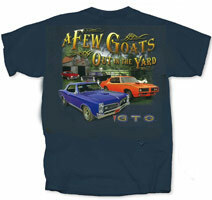 Pontiac GTO "A Few Goats Out In The Yard"
Highly Detailed Small Logo of the 1967 Pontiac GTO coupe on the front left hand side chest of this Tee, and with the scripts “A Few Goats Out in the Yard GTO” in the background. The script colours phase from Yellow to Orange. There is the Pontiac Badge emblem also printed on the smaller front image. Traditional known as the ‘Goat’ this fantastic brilliant artwork is of the two GTO generations released by Pontiac, from the General Motors stable. In the forefront of the artwork, the attention to detail of this 1967 Pontiac GTO two door coupe is remarkable. From the accuracy of the chromed and detailed front grille and bumper assembly, the power bulge hood pressing, through to the correctly scaled body and exterior chrome trim. Check out those factory steel wheels and cool White wall tyres! The GTO underwent a few styling changes in 1967. The louver-covered tail lights were replaced with eight tail lights, four on each side. Rally II wheels with colored lug nuts were also available in 1967. The GTO emblems located on the rear part of the fenders were moved to the chrome rocker panels. Also the grill was changed from a purely split grill, to one that shared some chrome. Alongside this first generation ’67 GTO, sits proud this second generation 1969 Pontiac GTO “The Judge”. With it’s vacuum operated “hideaway” head lights, through to the muscle car decals and bright body colour, this baby also included the Ram Air III engine, Rally II wheels without trim rings, Hurst shifter (with a unique T-shaped handle), wider tires, various manufacturers decals, and a rear spoiler. Let’s not forget these two beauties in the background. From the first generation of the GTO clan, we introduce the Black 1965 Pontiac GTO two door sport coupe, alongside her older brother, the Red 1964 two door coupe. Well detailed with accuracy of body trim and bright work, makes these both examples very rare ‘goats’ indeed. The background of the Tee illustrates the bold brilliant scene of a country Barn with a handful of Goats in the Yard behind the cars. The scripts “A Few Goats Out in the Yard GTO” is in the background. 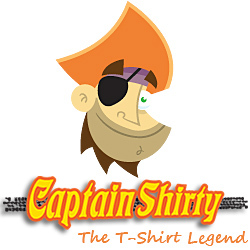 The script colours phase from Yellow to Orange, with pin striping. There is the Pontiac GTO Badge emblem also displayed at the bottom of the artwork. Tee shirt Colour: Available in Blue Dusk only with Genuine GM Official merchandise Tags.